along with the ability to mark users active or inactive including reseting user passwords should the need arise. 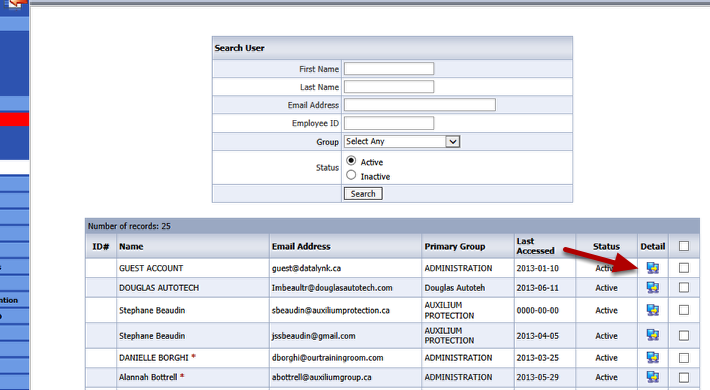 Having filtered the results to identify a person or persons of interest, you click on the Detail icon as depicted above to view the User profile and applicable transcript for that user. Much like your own personal profile, you as a manager of this person, have the ability to make any necessary changes to their details including the ability to reset their password. Assigning a Direct Report or Supervisor to an indidivial will grant that person the ability to view this person's profile along with the ability to report on his or her activities. More detailed information of this can be found under the topic Your Profile. Be sure to first make a selection using the checkbox to the right as to whom you would like to perform this action on. Multiple users can be selected at once. 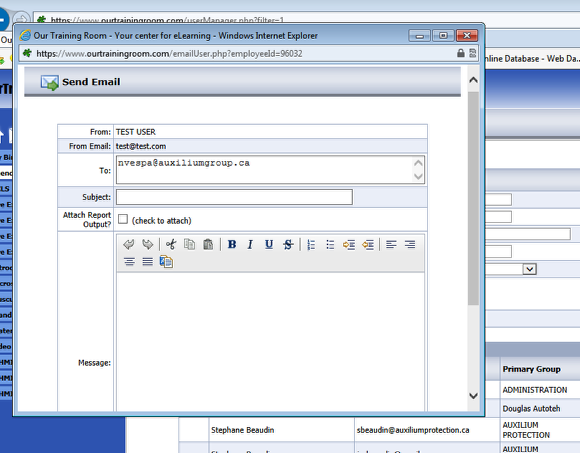 fields and click the Send Email button toward the bottom left to initiate a mail out.